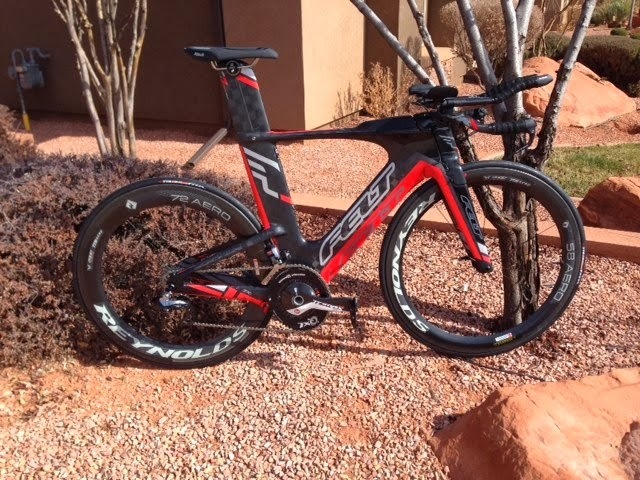 This bike is perhaps the most-anticipated triathlon bike produced in the last 10 years, and likely Felt's proudest accomplishment (ever) as a brand. 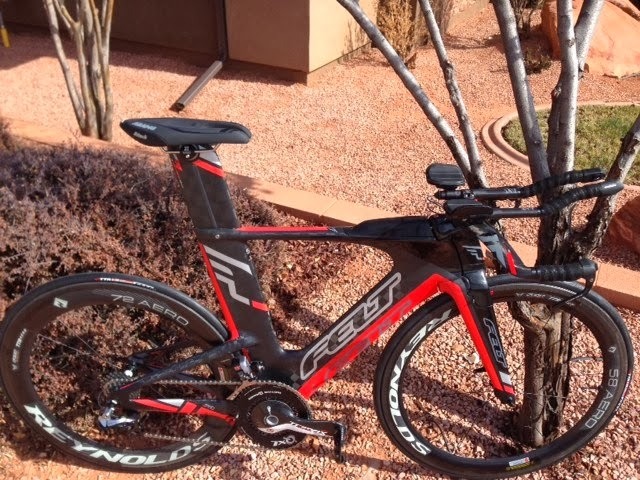 The 2014 Felt IA FRD is the fastest (according to wind tunnel testing) Triathlon-specific bike on the planet, and arguably the best-looking bike in its class. 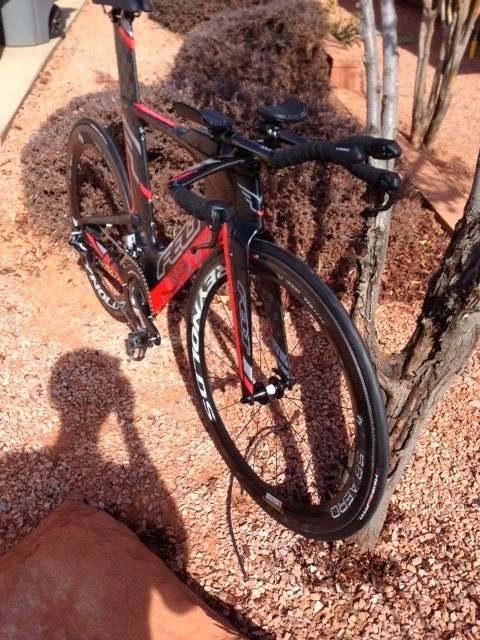 I am humbled to say that this particular bike (54) belongs to me (Kirk). Since setting it up (mere hours after it arrived), I have been riding it now for the past week or two and have it nearly dialed in. 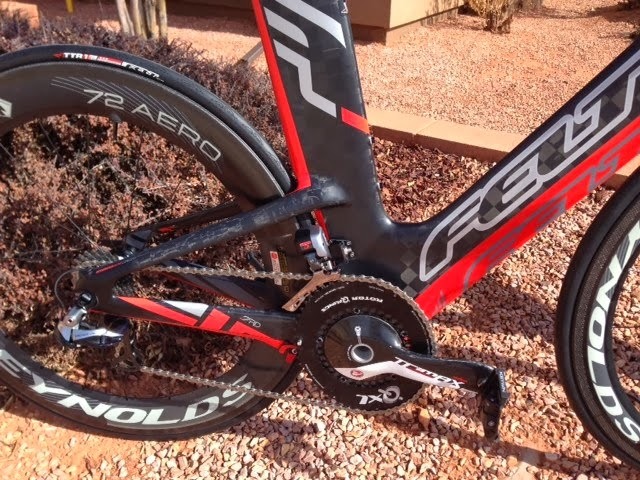 Unless you're confident with the wrench, I recommend having an experienced mechanic (one that is experienced with TT/Tri "Super" bikes) set this up for you. While nothing is overly difficult, if you lack experience with hidden brakes, Di2, internal routing, and integrated front-ends, you will be spending a LOT of time figuring out how everything adjusts. Save time and hassle, and have your local Felt dealer do it for you. Front Brake: I traded the stock pad holder bolt (4mm hex head) for one with a lower profile head. When the brake was centered over the rim (which was off-center from the fork), interference of the bolt head occurred with the front brake fairing. Simple fix. May not be an issue for other front wheels, didn't try another wheel to see. Was only off by 1-2mm, and perhaps acceptable to some, but I'm OCD. pad holder and brake arm to move laterally and hence interfere with the rear brake fairing. The brake itself can be centered and made to not interfere with the fairing, but then one brake shoe will contact the rim surface before the other side does. I prefer to have the pads be equidistant from the rim when the brake lever is not engaged. To me, this gives a more consistent and precise braking feel. Another option is to use the rear dropout set screws to center the wheel in the brakes (but not necessarily between the chain stays). I didn't do this because I wanted the rear wheel centered between the chain stays. Probably 6's, but that's what I did. Like I said, I'm OCD. Seat Post: The seat post design is elegant, simple, and has several benefits. 1. you don't have to worry as much about over-tightening and cracking the seat post. 3. lighter weight is obtained specifically for the seat post and seat tube. Follow directions and use carbon grit paste for a good slip-proof fit. Adjusting the height is easy. Loosen both 4mm hex head bolts on each side, move (or lightly "bump") saddle up or down, and re-tighten. I want to say 4-5Nm is the torque spec. I don't think I've ever seen a saddle tilt adjustment that works like this. 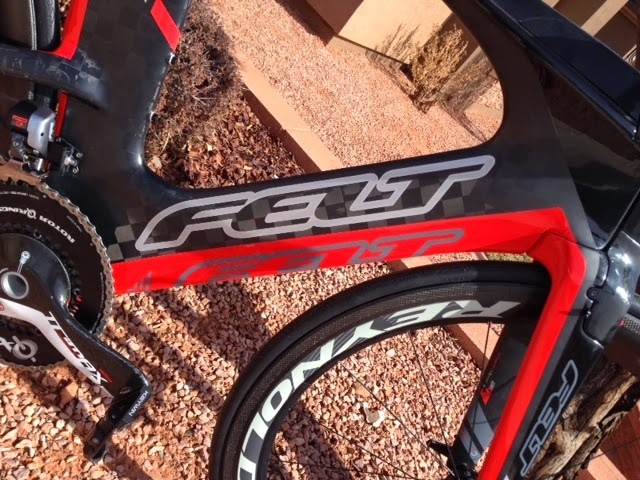 We have Felt AR1 and AR5 road bikes in our shop, and while the seat post height adjusts the same as the IA, the AR series uses a more common "infinite" tilt adjustment where you loosen the 4mm fixing bolt and tilt it up or down as you like and re-tighten. On the IA FRD, you actually have to remove the saddle in order to adjust the tilt. I already know what you're thinking but wait…….. The IA has a splined cylinder in the center with teeth that are spaced by 9.5 degrees, that integrate into an outer ring (splined as well, keep reading…...). This removable outer ring, then integrates into the seat post, with yet another set of splines, but in this case are spaced by 10.0 degrees. If you want to tilt your saddle down by 1.5 degrees, simply rotate the outer ring forward by 3 notches (30 degrees total), then rotate the inner splined cylinder by 3 notches (28.5 degrees total). The net downward tilt is 1.5 degrees. When I was dialing the tilt of my ISM Attack saddle (stock on the IA), I worked in 0.5 degree increments until I found my happy place. 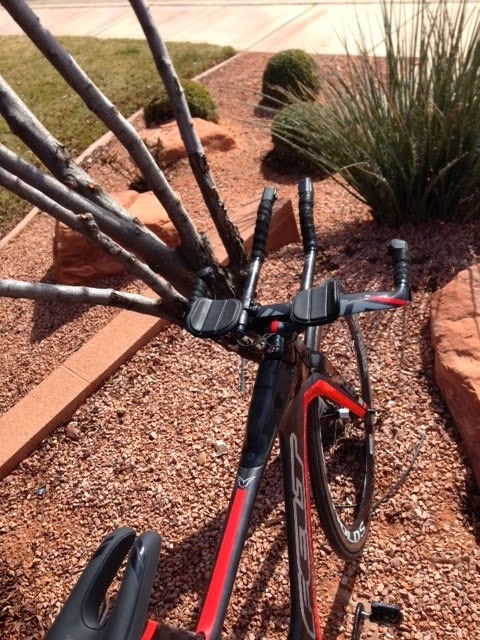 This may seem like a daunting task - removing the saddle every time you want to adjust saddle tilt - but what I like is that you can be consistent and methodical in your adjustments, knowing where you're at and where you're going, by increments of 0.5 degrees. For all practical purposes, I can't imagine anyone needing a 0.25 degree adjustment. 0.5 degrees is hardly noticeable while 1.0 is likely noticeable only to experienced riders with lots of saddle time, and a 1.5 degree adjustment noticeable to most anyone. During fits I always tell athletes that the difference between the "best saddle EVER" and a "torture device" could be 1 or 2 degrees. With the IA tilt system, you can now make methodical adjustments at 0.5 degree increments. Nice. This bike is dreamy for all sorts of reasons. One being the handling. The IA is incredibly smooth. I just love riding this bike. The word inertia comes to mind. 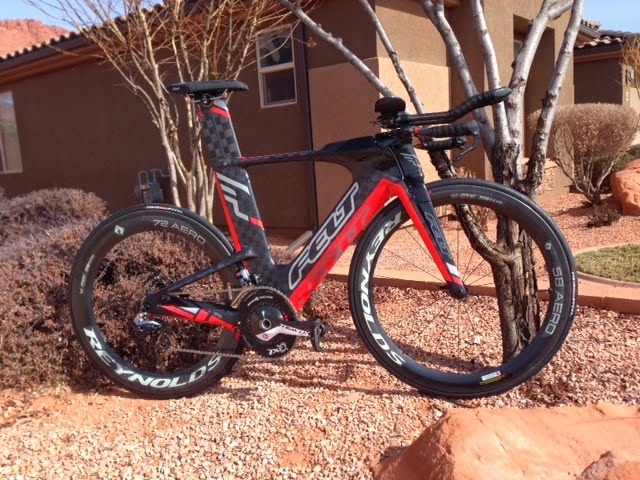 Once it gets going, it likes to keep going…… Whether no winds, cross-winds, bumps, chip-seal, smooth roads, the bike is very predictable, forgiving (compliant), and incredibly smooth. Very smooth. Around St. George, we have an opportunity to ride all sorts of road surfaces and today I road on brand spankin new pavement as well as large aggregate chip-seal. 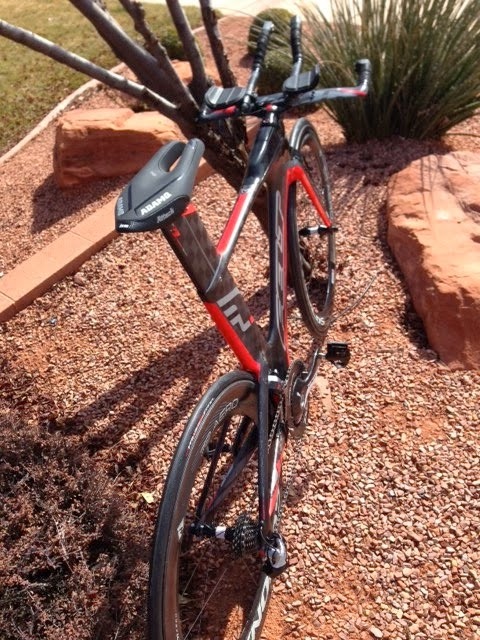 It smoothes out the rough stuff better than other TT/Tri bikes I've ridden. It's also incredibly solid-feeling. Power transfer is awesome, it just feel SOLID. You feel connected to this bike. It's not at all squirrely or twitchy. The opposite in fact -- it just moves down the road and makes it easy to hold a nice straight line. In cross-winds, the HUGE frame cross-sections add considerable stability. 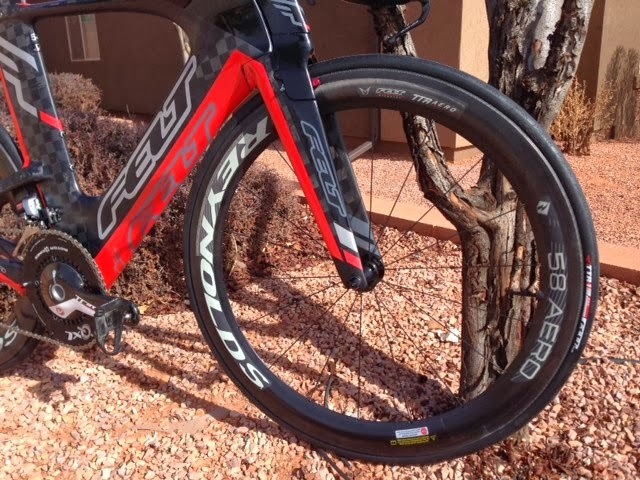 (I've been riding with the stock 58/72 Reynolds Aero carbon clinchers -- very nice!). Perhaps this is contrary to what you'd expect -- thinking goes something like this: bigger surface area to catch the wind and get blown away like a kite…… But the opposite is what actually occurs. Somehow, the extra fat cross-sections add stability to the way the bike is affected by cross-winds. The CFD and tunnel guys understand it better than me, but it's very easy to feel it when riding this bike. You feel very secure and confident holding aero position in (relatively) gusty winds on the IA. We have several opportunities in winter/spring to ride in various wind conditions -- in fact the city where Ironman St. George Swim and T1 is, is called "Hurricane"……... because it's named after, well, hurricanes. 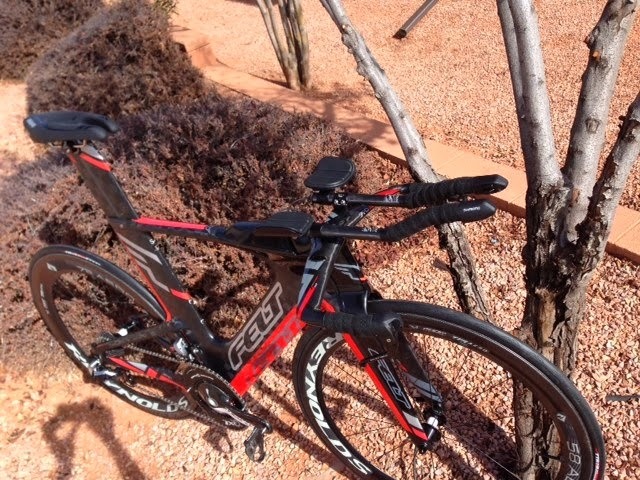 I would be willing to bet there is a very noticeable difference in the way your current TT/Tri bike handles and the way the Felt IA handles in cross-winds. It's that good. With this bike, you set SAIL and GO! This thing handles bumps like a 1960 cadillac. 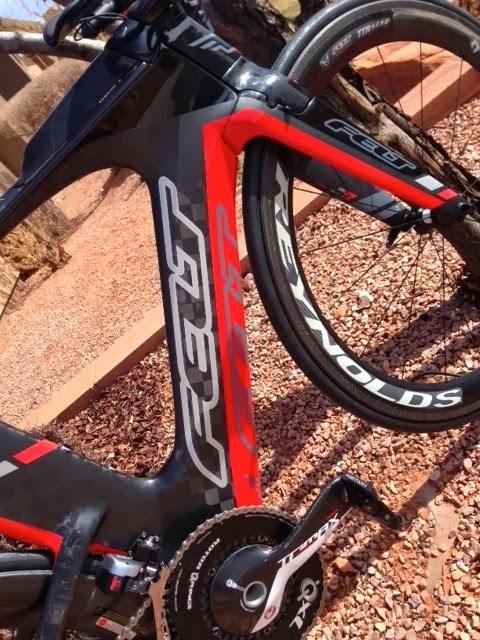 It smooths out the road surface (relatively speaking) compared to other, more harsh-riding, high-end carbon frame-sets. Stiffness is great, but what about when it rattles your brain loose? What most people don't realize is just how many watts a rough road surface can steal away from your legs. For those of you with power meters, you know. The difference between smooth and extremely rough (new) chip-seal roads can be 5 - 10% (in my experience). I clearly recall racing the 2011 Rev 3 Portland race. 2 loops of out and back on a nearly pancake flat road that had sections of extremely rough (sometimes missing) pavement. The smooth section of road was always to the right of the white line, while the rough was the right wheel track created by autos. In USAT rules, the Pros follow the Stagger Rule, which requires staggering left or right from the rider in front no matter how far ahead they are from you. That meant the first rider in a group was always going to ride to the right of the white stripe and every other rider behind him as well. 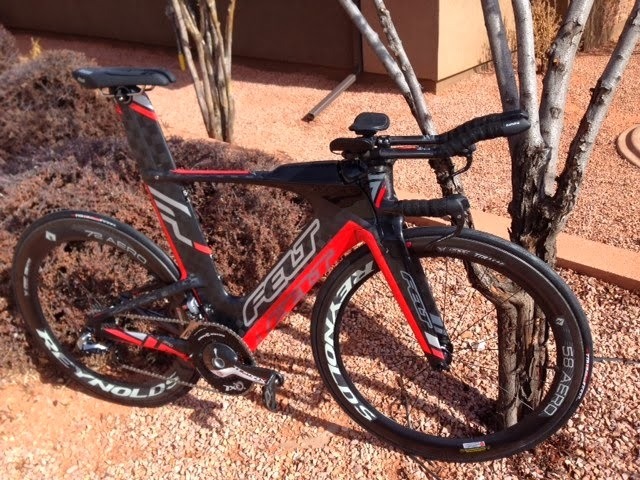 The even-numbered riders in a pack would be stuck on the left of the white line on rough pavement, and speed differences for a given wattage were easily 1 - 2mph. In addition, it was difficult to near impossible to maintain the same wattage while traveling on rough pavement. For me, that meant ~310-ish on smooth, and ~285-ish on rough for the same perceived exertion. 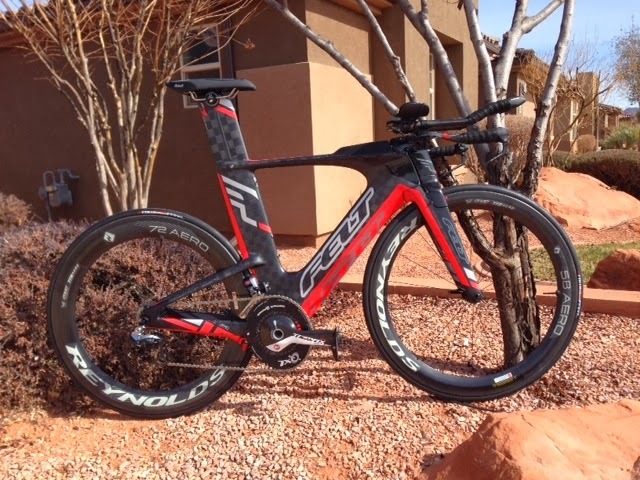 A bike that is capable of "hiding" rough surfaces from your legs so they can put more watts into the drive-train is a good thing - actually, it's a great thing. Felt nailed the balance of stiffness and comfort on the IA. No tinkering, no drilling, just follow Felt's simple instructions. Cleanest Di2 bike I've ever set up and the best part is I didn't have to do anything other than follow instructions and look at the provided diagrams for wire routing and Junction box placement (it's hidden in the front brake fairing, right alongside the front brake). No tinkering, no drilling, just follow Felt's simple instructions. I'm very leggy for my height of 5' 9 3/4". My saddle height (center of BB to top of saddle) is about 78.8 cm, on 170mm crank arms. I chose a 54 in the IA, although I would probably be on a 51 in a Felt DA. 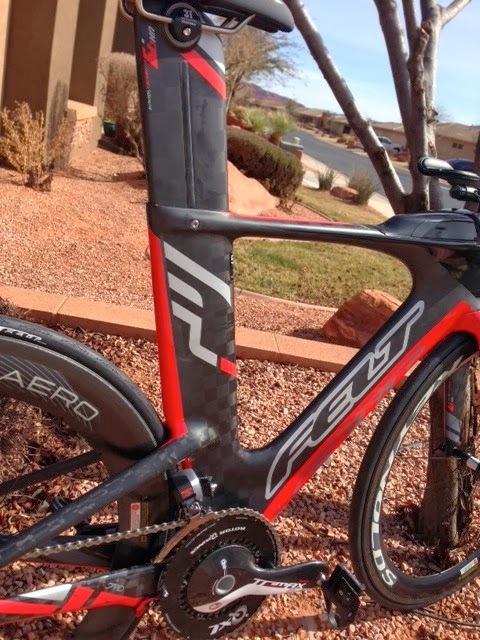 The IA is probably more short in the reach than you might be use to when sizing/fitting other TT/Tri bikes. But that's not a bad thing. 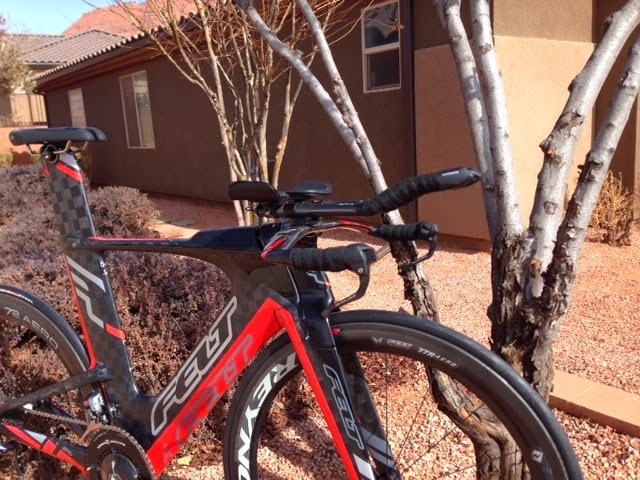 When fitting someone to their own existing TT/Tri bike, I oftentimes find myself finding ways to bring the pads back and closer to them -- a good percentage are just too stretched out on their bike. Either they were sold a bike that's too big (and long) or their saddle is mounted too far back. On the Argon 18 E-118, I chose a small for myself in 2013 for this exact reason - the reach on the medium would be too long. In 2012, on my Blue Triad SL, I chose a Medium frame with 8cm integrated stem (rather than the normally supplied 10cm stem length). The small was too low in stack, but the medium was too long in the reach with the normally spec'd 10cm, so my only option was the medium with shorter stem. On the 54 IA, I have the pads installed behind the mounting post but as far forward as they will go and still be behind the mounting post. This is a fairly central reach placement out of the available reach "range" of the bike. I'm not use to that happening to me, being a very leggy ~5'10" with short torso. As for the stack, I'm using no integrated stem spacers, no post-mounted stack spacers, with the extensions mounted above the bar (they can also be mounted below the bar) and getting a saddle to arm-pad drop of ~16.5 cm. It didn't even occur to me until Dave Koesel from Felt explained to me that the extensions can be mounted independently of the arm pads. For example, the extensions could be mounted under the bar on the narrow or wide posts, while the pads can be mounted directly to top of the bar (again on either the narrow or wide post-mount option) for the lowest possible arm pad stack. I think the absolute lowest arm pad setting would probably give a drop of around 19cm for a saddle height like mine of 78.8cm on this 54. In addition, Felt is also in the process of producing a 31.8mm compatible stem that will accept traditional (round) base bars, upon which you could mount the bars/extensions of your choice. 2 additional stem spacers come with - 15mm and 40mm. A variety of post-mounted stack spacers come as well -- 40, 30, 25, 20, 15, 10, 5 (don't quote me exactly on the in-between, but 40mm is the tallest with 5mm the shortest). Keep in mind, the extensions can also be mounted without any stack spacer, an alternatively may be mounted below the bar using none or any of the above-mentioned stack spacers. The arm pads may be mounted on either side of the extensions, OR may be mounted independent of the extensions, directly to the narrow or wide post-mount. point is, LOTS of options going on here. If you're like me, you'll have to stare at the whole situation for awhile and use your imagination to figure all the available options. 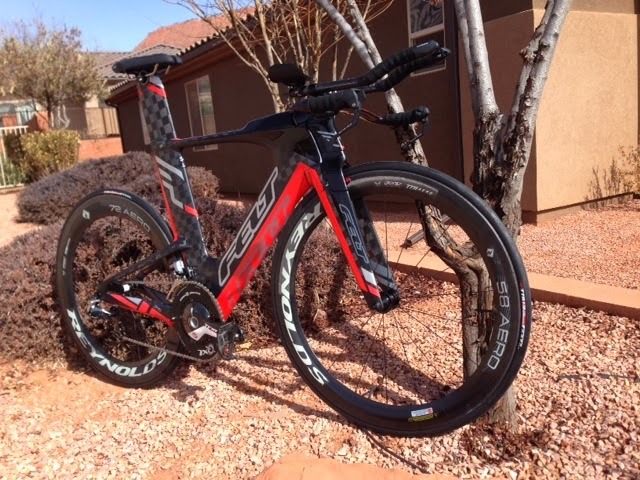 For the most part, Average-Joe triathlete will have no trouble finding his/her position on this bike. The rider type that may struggle to find their position on this bike is the short-legged, long torso-ed athlete with outstanding range of motion that prefers a big saddle-to-pad drop. With an already low saddle height, this athlete may bottom out the arm-pad rests on the base bar while still desiring more drop. Not ultra-light at around 18.5 pounds w/o pedals but the bottom line is this: it just plain doesn't matter. 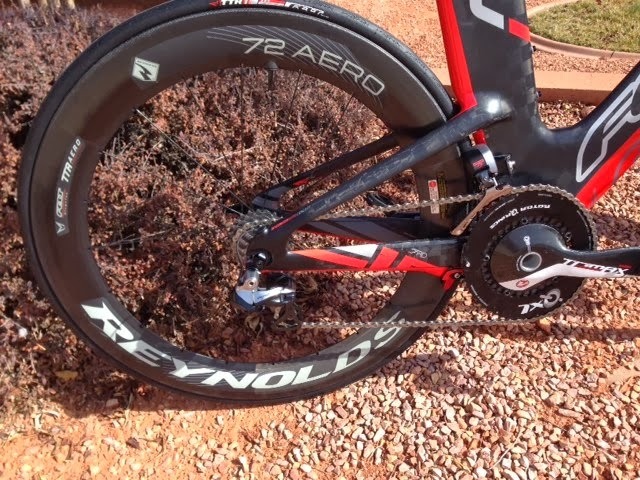 This bike is so stinking aero, handles extremely well, and is so comfortable, weight is almost meaningless unless T2 is 3,000 feet above T1! Will probably add more info later as I get more miles on the bike. For now, I'm just enjoying getting out on this thing 2-3 times each week! 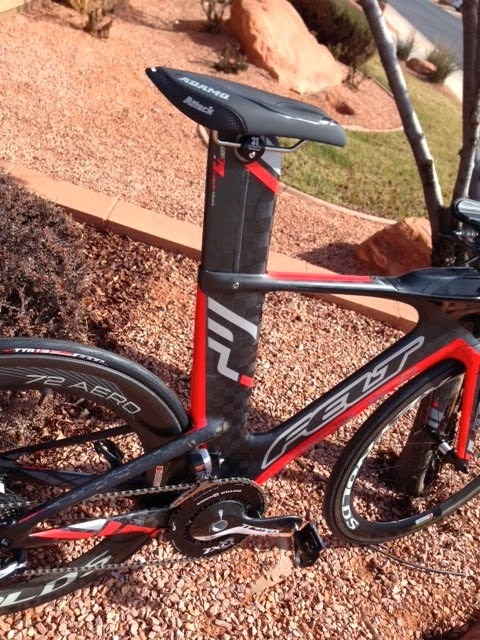 IMO it's the best looking TT or Triathlon-specific bike, but that's up to you to decide!